100% jersey cotton with high quality, machine washable. -Easy to put on,this sheet is very easy to stretch over the mattress, you no longer dread changing the sheets. -With all surrounding stretchy elastic, makes this sheet fit mattresses perfectly and snugly. 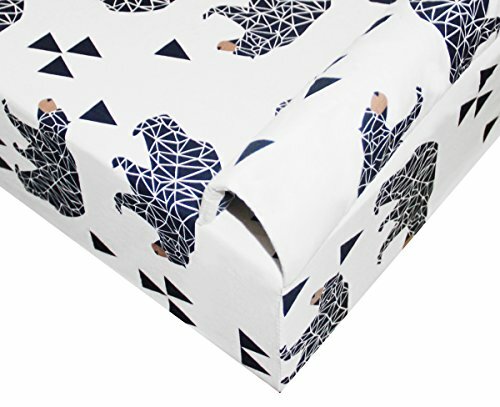 -White color with cute navy bear pattern, this color co-ordinated with any bed all nicely. -100% cotton baby bedding fit perfectly even after laundering numerous times and has worn very well. -fit perfectly, feel just like the sheets in your bed. -52 x 9 x 28 inches, 2 pack crib sheet jersey fit standard crib and toddler bed mattresses, ideal baby shower gift. Unisex fitted crib sheet can be used for both girl and boy, neutral colored baby bed sheets matches all decor in kids room. If you have any questions about this product by SLEEPING LAMB, contact us by completing and submitting the form below. If you are looking for a specif part number, please include it with your message.